Stuck inside in these winter months turning circle after circle in the indoor arena — or else just going through the motions of horse chores, waiting for the weather to ease up to let you ride again? Don’t worry, because there’s plenty to occupy you inside… such as getting your taxes together. Yes, that annual activity is about as fun as getting a tooth pulled as you read and reread each line, trying to figure out exactly what the IRS wants from you this year. Here are a few tongue-in-cheek questions that every equestrian finds themselves asking at tax time. 1. Can I write off my show entry fees as gambling losses? Legitimately, in college when we rode a lot of team sortings, I had an accountant friend who would always shake his head as we filed out of the pen and say “well, that’s my kind of gambling.” If we actually had a good night, we might break even… and that’s for sorting, which has a fairly high rate of return. For most shows, all you’re going to be winning is a 50-cent ribbon. 2. Do lessons count as continuing education? Okay, I’m not actually suggesting that you take out student loans to pay for lessons… all I’m saying is that if you did, you could get a deduction for paying them back. As it is, we only have to pay for lessons the first time around, and that’s probably enough, even if we do keep taking them… forever. 3. Can’t I count all those hours of manual labor tending to my horse’s every whim as being self-employed for a deduction? 4. 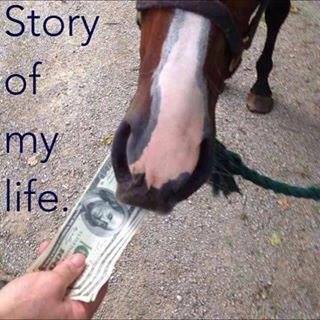 Buying that new horse was a life-changing event!… right? In most people’s terms, yes, definitely — and congratulations! In tax terms, that’s a big fat nope. 5. Why can’t I call my horses dependents? From what I understand about having children, you love them, while also spending an exorbitant amount of money to keep them fed, clothed, happy and healthy. As a disclaimer, I don’t have kids. I do have horses, whom I love, while also spending an exorbitant amount of money to keep them fed, clothed, happy and healthy. So what on earth is the difference here, IRS?? Dream on, folks. And happy tax figuring.